The vile critters in action. 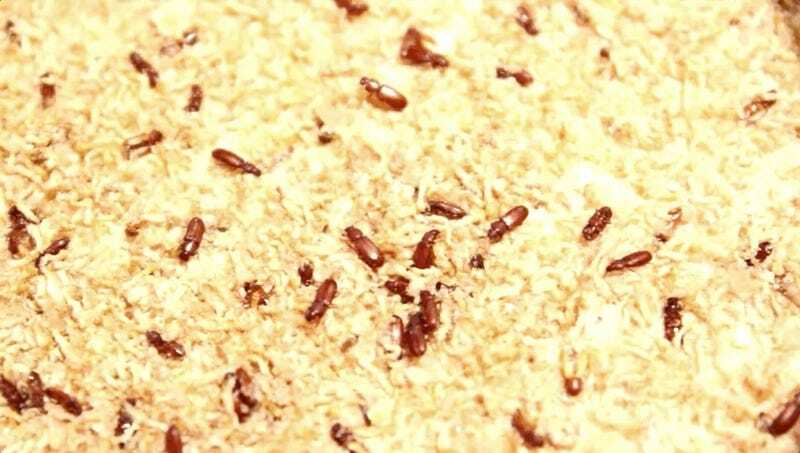 While the Padres would like their fans to know that grain beetles pose no risk to humans, I would like to emphasize that they are, in fact, gross beetles that get into your cereal and elbow macaroni, and that’s a kind of psychic harm from which a person may never recover. Exterminators say the disgusting bugs usually get into your home via packaging that was infested at a grocery store, and that once in your home they will “quickly spread to other bagged or boxed products,” until one unfortunate morning you pour out a fistful of beetles in your bowl of Milk and Honey Original Café Mix and immediately fall over dead from pure horror. A few thousand hats were distributed among the announced crowd of 35,771. Ushers went around with plastic bags trying to collect them, although some fans were seen hiding their hats. The sensible, non-beetle-infestation-coveting fans from Saturday’s game were reportedly issued a voucher for their complimentary beach hats, which will be shipped to their home, free of nightmare beetles, by the vendor.